This web template is an uncomplicated fishing website theme developed for different types of online projects. Fully responsive, cross-browser compatible and SEO-optimized, this impressive fishing and hunting website web design works extremely well with fishing supplies or fishing accessories websites. The visitors will definitely enjoy this navigation and visual elements that lead them effortlessly throughout the site. The fully responsive template will adapt to any display resolution. As you can see this template is unobtrusive and gives plenty of points to user experience, therefore boosts the amount of your potential clients. Well-documented and offering cost-free 24/7 support, this web theme will allow you get started with your internet project straight away. All set to discover the maximum capacity of this specific web layout? Then proceed to checkout. 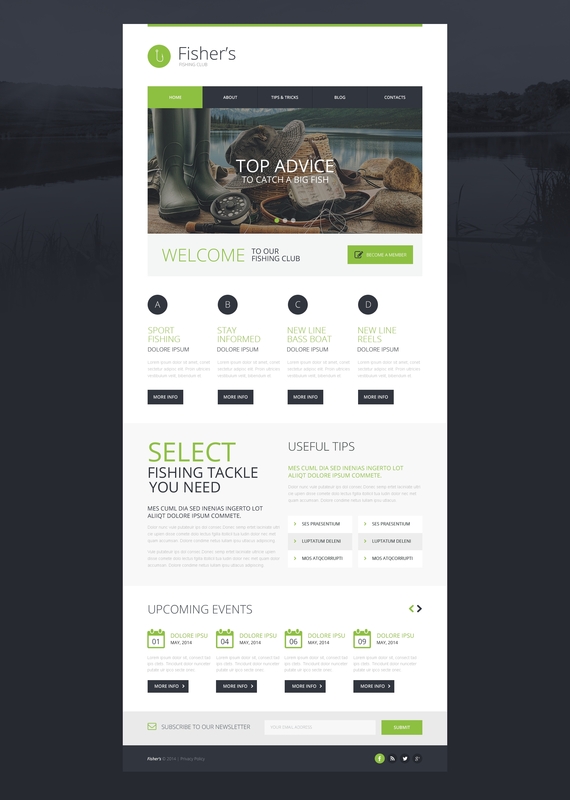 Very nice design for fishing themed websites. We used it for a fishing contest website. Every events are well organized in this template. Love the colors and the clean interface. Well documented, easy to install. Grid system is perfect for work. Built in contact form and newsletter subscription form makes it easy to do some interaction with the visitors. TouchTouch gallery works well on all handheld devices.